Poppers are always a party favorite, as this terrific version will easily prove. Grease a baking sheet with sides with olive oil. Place jalapeño halves on baking sheet. Combine cream cheese, dried cranberries, cranberry sauce, garlic and salt in large bowl; mix well. Spoon filling into jalapeño halves. Top cream cheese mixture with crushed crackers. Wrap half-slice bacon around each filled jalapeño half. Secure with toothpick, if desired. 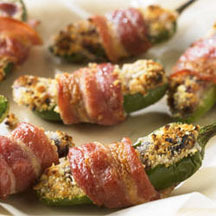 Tip: Poppers can be baked in a 350°F (175°C) oven for 25 to 30 minutes or until bacon is crispy.